A world leading score of 17.73 meters left British jumper Phillips Idowu to seal the title of men's triple jump at the 12th World Athletics Championships in Berlin on Tuesday. Idowu thus edged world and Olympic champion Nelson Evora from Portugal, who took a silver by jumping 17.55 meters, shy of 17.74 meters he jumped in Osaka of Japan two years ago. Cuba's Alexis Copello ended up with a bronze thanks to his final jump of 17.36 meters. "I feel very good because all my hard work and all that traveling finally paid off," said Idowu. 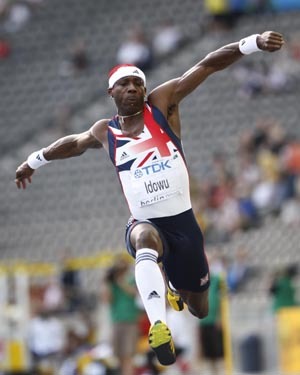 17.73 meters is also the personal best for the Beijing Olympic silver medallist, when he finished with a 17.62m leap. The newly-crowned world champion said he had managed to compete whole season and to stay injury free, so he could reap finally in Berlin. "Today is one of the best days of my life. It is amazing feeling," he said. However, Evora, the top favorite to the event prior to Tuesday's final, believed he could have beaten Idowu to defend his title in this event. "I tried all my best to jump well. My personal best is 17.74 and I thought I could reach that level today, but it didn't work," he said. "I'm still very happy, this is my first silver medal too. I appreciate having rivals like Idowu because it is good for the sport and also good for the show," he added.